Hey Scott . . . so much fun to see you’re still using the term 10 years (I checked) after you gave my article credit for turning on your light bulb. Brilliant insight of yours! Become quite the profession. I was there in London when you presented this. Loved it! My 5 cents on Centralization and Decentralization, if that is ok. 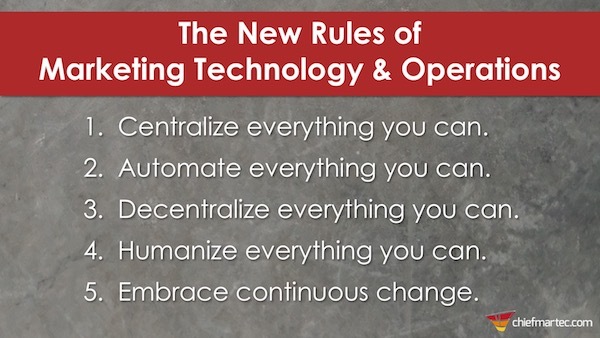 The paradox is perhaps much smaller if we ask ourselves WHAT we advice marketers to centralize or decentralize? Technology, content, brand. compliance, decisions, data, budgets? All of the above? As a rule of thumb I like to think of centralizing the infrastructure, like a highway network, and decentralizing the way people want to use it to their benefit. This infrastructure applies to technology, data, brand and content. In my mind centralization involves the decisions on WHAT to centralize, the “rules of engagement” or internal “SLAs” and communicating them clearly. This allows for an agile way of working. The Agile & Scrum frameworks do in fact the same. Concerning WHAT to (de)centralize we can apply what the Microsoft stackie suggests: System of Record, Differentiation and Innovation. Why not work with Content of Record, Differentiation and Innovation? Or Data of Record, Differentiation and Innovation? 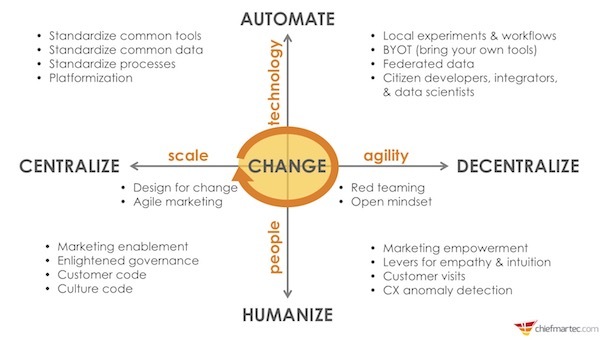 I’ve been doing some work with enterprise software sales teams on how to engage the MarTech team and I think this is a great model for how to align the differences between many tech and marketing mindsets. You can have your cake and eat it too.